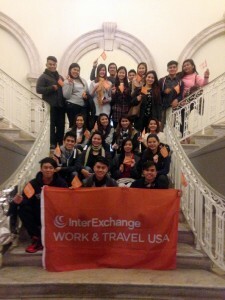 Last week, InterExchange toured New York City's City Hall with spring participants from the Philippines. Staff from NYC Mayor Bill DeBlasio's office led participants through the historic building while discussing it's architecture and what happens in the offices found inside. Participants learned that the current City Hall building was constructed from 1803-1814 and is actually the third building to be considered the NYC City Hall! The tour guide also explained the three branches of government in NYC: the legislative, the executive, and the judicial. Most notably, participants were able to witness the legislative branch in an NYC Council Meeting and hear about some of the issues that affect New Yorkers. Council Members were excited to see exchange visitors take an interest in local politics and culture. Thank you to Mayor DeBlasio's office for the wonderful opportunity to learn about NYC history and government!